Take your time with cheesecake; it will pay off with no cracks, a perfect texture, and a need to run at least 10 extra minutes on the treadmill. If you are still searching for that perfect holiday dessert, I have one for you. For both religious and secular celebrations (Christmas, Thanksgiving, Chanukah), this cheesecake is a winner. Why? It’s a dairy dessert, served cold and it’s gluten-free (if you make it with corn starch, not flour). It can be served with fruit or fruit topping or whipped cream. It can be drizzled with chocolate or caramel. It pleases those who like something a little savory and those who like something a little sweet. And as the un-ironically named Cheesecake Factory has discovered, you can throw nearly ANY other sweet ingredient in the wold into it without ruining it (well, almost). It’s a desert associated with NY (for lovers and haters) and also associated with luxury— often found at expensive restaurants and steak houses. That makes sense, because as a make-at-home dessert, it’s a bit labor-intensive. Although it likely originated in Greece, I grew up eating cheesecake at Junior’s in Brooklyn, NY, and in other places around the NYC area in the 70s. Those velvety, creamy and hint-of-lemony cheesecakes were so perfect—in flavor, texture and appearance, that I never ever thought I could replicate it at my home. I just assumed that was something you had to have a factory replete with big steaming pots and viking stoves to make. That, and lots of mysterious-as-to-how-to-fold boxes and of course, a giant floor-to-ceiling spool of red and white string. Then, years later, BFF Jill gave me her Mom (Isabel)’s cheesecake recipe. It was authentic 70s and NEARLY perfect. Like a lot of recipes from that time period, it suggests that you toss everything together (including—gasp—corn starch). It suggests you mix the ingredients on HIGH. And it doesn’t tell you anything about how finicky Springform® pans really are. (If you bend one, you might as well throw it out IMHO). Reportedly there are national and international variations on Cheesecake, but the recipe below produces a Cheesecake of the New York variety—dense, creamy and full of sour cream. So after making it several times, I have concluded a few things that you might not know from the recipe. 1. Springform® Pans are not waterproof. If you’re going to make a cheesecake, you should protect it. There are a myriad of ways for you do this, with foil, inside, outside or both. Either way, your goal is to make sure the water you are putting the cheesecake in to cook stays outside of the pan where you want it, not inside your cake, where it can nearly ruinous as water is for chocolate. You’ll thank me. 2. Cheesecakes and their ingredients are sensitive. For this reason, I don’t recommend you beat the ingredients on “High” in your mixer. After you pour the mix into your greased Springform pan, knock it a few times to get out the air bubbles. But after that, don’t run or jump near the oven, as it can lead to cracks in your Cheesecake. If you kids, tell them not to run or jump near the oven either. 3. Do not throw unsifted corn starch into a full complement of dairy products. Instead, add it to the lemon juice (or vanilla) and whisk it to create a slurry. Corn starch likes to be in a liquid, and mixes better with the other ingredients that way. 4. This recipe doesn’t have a crust. Jill and her Mom did not favor a crust. I like a graham cracker crust. You have to find the one that works for you, but if you can’t find one, here’s a start. 5. It’s all about NOT cracking. 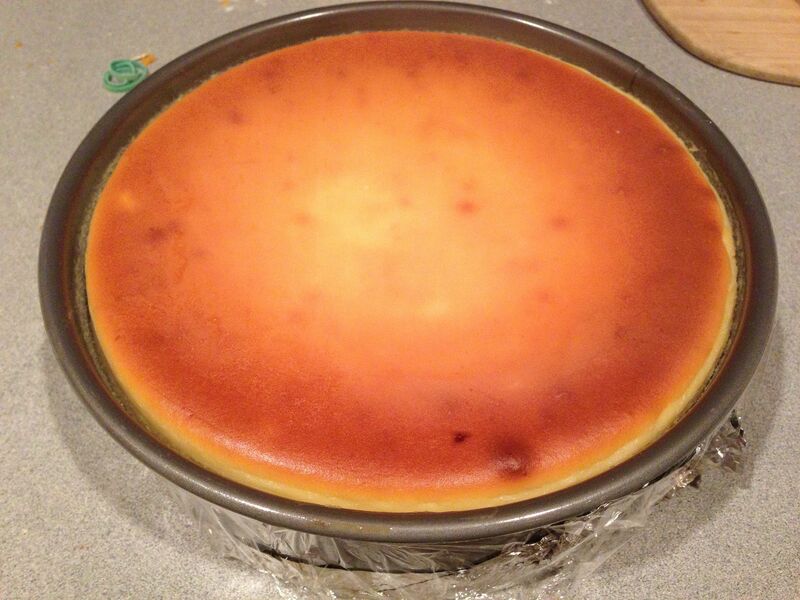 As you may learn, over-mixing, overcooking, under-greasing, and a host of rookie mistakes (some detailed here) will cause the top of your cheesecake to crack. Now that obviously doesn’t change the taste at all, and if you’re wise, you’ll cut a cracked cheesecake out of sight of your guests. But eventually it will become a point of pride to produce seamlessly crack-free top. Until then, it’s still worth all the fuss. 4 8-oz containers of whipped cream cheese (as long as you bring it to room temperature it probably doesn’t matter whether you use bricks or tubs). Let cream cheese, sour cream, butter and eggs stand at room temperature for approximately 1 hour. (I take them out in the morning and make the cake in the afternoon. Don’t start the cake too late, it has a multiple hour progression— it’s not 12 minute chocolate chip cookies). Using a stand mixer, blend cream cheese, butter and sour cream together with sugar and vanilla. Beat in one egg at a time. Continue beating until mixture is very smooth. In a separate bowl, create a slurry with the lemon juice and corn starch. Add to the other ingredients. Pour mixture into a greased 9 1/2 inch springform pan. (I use butter, but use PAM if you like). Place the Springform® in larger roasting pan filled with water about hallway up its side. Bake for 1 hour until the top is golden brown. Turn off oven; let cake cool in oven for one hour. Then cool on the countertop for an hour (but really until cool); store in refrigerator overnight if possible (and 24 hours wouldn’t kill you, either). I cover it with plastic wrap. Take out of the refrigerator at least 15 minutes before serving, unless you really like cold cake. Celebrate your New York cred. Enjoy the luxury life. And if celebrating a holiday, have a great one. Posted in Desserts and tagged Brooklyn Cheesecake, Butter Cream Cheese, Holiday Cake, Holiday Dessert, Isabell's Winning Cheesecake Recipe, Lemon Vanilla Cheesecake, Perfect Cheesecake, Thanksgiving on November 23, 2014 by Robert Deutsch.